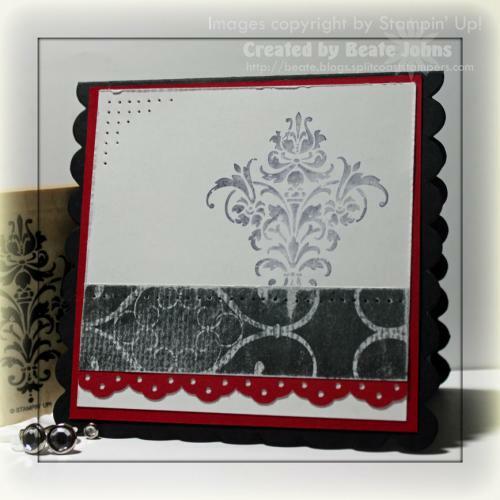 When the Dare To Get Dirty Challenges were going on a couple of weeks ago, I really wanted to participate in Sharon’s, but I didn’t have the right designer paper. I was excited to see black/white Designer paper in the new Mini catalog and ordered it right away. I used it for today’s sketch challenge. My card base started out as a 4 1/2″ x 8 1/2″ piece of cardstock folded in half. I cut it with the new Scallop Square Clear Die from Big Shot. Next I cut two pieces from the Night & Day Specialty Designer Paper, the darker one measuring 1 3/4″ x 3 7/8″, the lighter one a 3 7/8″ square. I taped the darker strip to the left hand side of the lighter square and tied 5/8″ wide red grosgrain ribbon over the point where the darker designer paper ended. 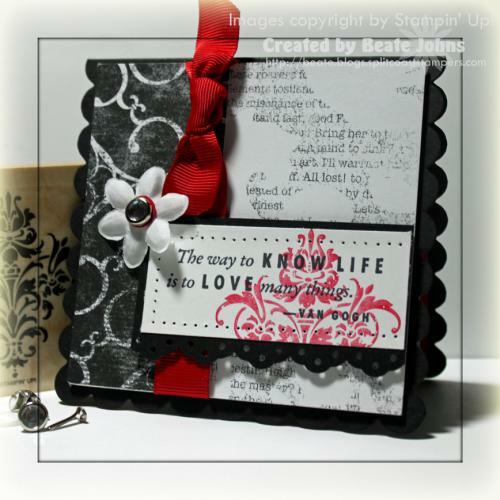 The sentiment is fromDreams Du Jour and was stamped in Black Stazon on a 1 1/4″ x 3″ piece of Whisper White cardstock. The medallion (oh…I LOVE that stamp) from Friends 24-7 was stamped on the right hand side of the sentiment strip in second generation Real Red ink. It was layered on a slightly bigger piece of Basic Black cardstock. The bottom of that strip had been punched with the Eyelet Border punch. The edges of the White cardstock had been paper pierced. The sentiment strips were adhered to the card base with dimensionals. To finish off the card front I added a Pretties Kit flower that had a Clear Rhinestone Brad in each center. For the card base I started with a 3 7/8″ square in Real Red. It was layered with a 3 3/4″ Whisper White square. The designer paper strip measures 1″ x 3 3/4″. A small strip of Real Red cardstock that had been punched with the Eyelet Border punch was taped underneath. The top of the Designer Paper was paper pierced and the entire piece sanded. The medallion was stamped in second generation Basic Gray ink. The top left edge was paper pierced. pretty, pretty. Very Twilight-y! Mmmmmmmm! Gorgeous Beate…. I love black and white. It’s SO elegant! Have a great weekend girlfriend! Oh, how funny — Lori and I did cherries and you and I did the b/w thing! I started to have ribbon coming off the top of my 4.25″ square card, too! Love that new paper and this flourish is beautiful! Thanks for a great sketch and for getting around to my DTGD challenge! 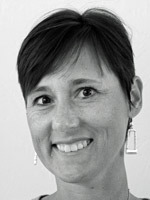 Beate, this is so striking!! There you go AGAIN…showing me another product that I didn’t order but now wish I did!! LOL! What was I thinking not getting that paper? Your card is just gorgeous! Thanks for the wonderful sketch! Ohhhh, That is a pretty color combo. That paper is on my list to order next. Awesome card! Thanks for the sketch. What a beautiful card!! Thanks for your inspiration. We have got to get together one of these days. Maybe after school starts for us up here. Your cards are beautiful, every one of them!! Fabulous card for Sharon’s DTGD challenge, and with the sketch!! I love the pretty paper and images!! LOVE your cards! Just got this paper and it is GORGEOUS …and with window sheets! You offer great inspiration. Thanks. Aren’t they the most fabulous black and white papers? They look even better in person! I was so excited when I opened my new package. I am thinking this is one package that will get used up to the very last piece! I like the non-Halloween card you’ve created with them. It is SO elegant! The dab of red is just perfect.